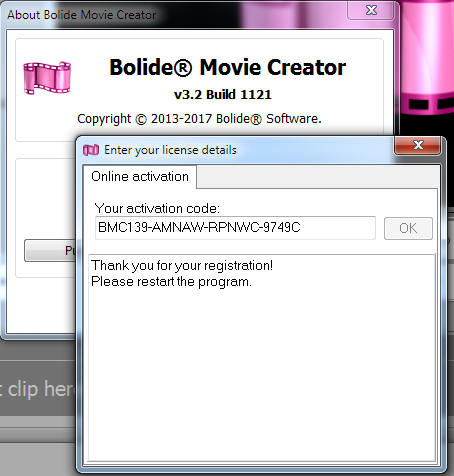 The Bolide Movie Creator activation code looks like BMC1XX-XXXXX-XXXXX-XXXXX. You need to enter it (preferably by copying and pasting, not by typing) in the Bolide Movie Creator activation dialog box. Please do not mix it up with the order number! It's very easy to activate Bolide Movie Creator and get the full version. Launch it, select "Help –> About" in the menu, and when a dialog box appears, click the "Activate" button. Then paste your activation code into the appropriate text field and click OK. Please note that online activation is used, so Bolide Movie Creator must be able to access the Internet. Bolide Movie Creator activation code – for free! Do you want to get a Bolide Movie Creator activation code for free? Great, you have that opportunity! You are welcome to get a free license for Bolide Movie Creator if you help our project. (Contact us and tell about your advertisement abilities.) For your own sake, please do not try to obtain a Bolide Movie Creator activation code by dishonest means. In a couple of cases, someone tried to pass off file-encrypting ransomware as "cracked Bolide Movie Creator". Only an officially acquired Bolide Movie Creator activation code can bring you joy and happiness instead of loss and pain. Besides, you can buy our video editor easily and for a very reasonable price. Did you lose your BMC activation code? No problem, use our automatic reminder.